Source Family women pose for a promotional photo for the Ya Ho Wa 13 record release, Los Angeles, 1973. Photo courtesy Isis Aquarian archives. 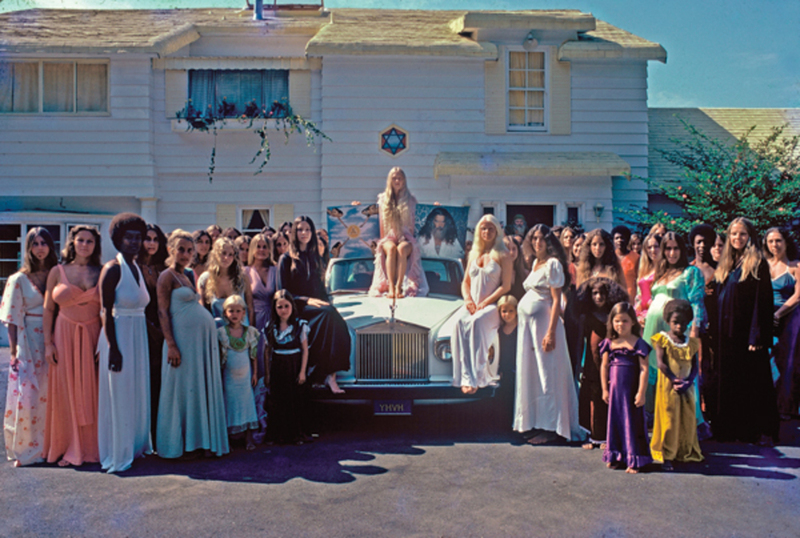 The documentary follows the Source Family’s arc to its end, which came not long after the group’s relocation to Hawaii and Father Yod’s 1975 death in a hang-gliding accident. Along the way, there are some odd, socioculturally fascinating moments, such as footage of the Family’s psych band (variously named Father Yod and the Spirit of ’76 and the Ya Ho Wha 13) performing in 1973 in front of some apparently flummoxed teens at Beverly Hills High School. But for the most part, the film seems less interested in drawing deeper connections between the Family and the culture from which it emerged (and on which it exerted its influence) and more in concentrating on the exceptionality of the Family’s internal structure—especially on Baker’s paternal and sexual magnetism, which the movie emphasizes as the cult’s central animating mechanism. This is too bad, because the Source Family’s story seems significant beyond its ability to tell us something about a particular set of relationships. One of the more intriguing (if superficially examined) elements of The Source Family is the present-day interviews with some of the Family’s former members, a fair number of whom still seem generally sympathetic to the community’s basic principles. And while there’s certainly a smattering of off-the-grid apocalyptic thinkers and recluses in the bunch, most interesting are the more conventional interview subjects: the life coaches and health-food store owners and forward-thinking tech CEOs and Internet-based spirituality advisors, among them a man who, while still presenting himself as “Orbit” (his Source Family name), has traded in his white robes for a yellow Livestrong bracelet. The Source Family could have provided us—and unfortunately doesn’t—with a clearer understanding of those cusp moments between eras. Not just the point at which late-’60s hippie culture infiltrated straight culture deeply enough that a successful businessman became a spiritual leader and, eventually, a god to a group of people, but also that moment’s shift into the place we find ourselves today—where New Age has been mainstreamed, spiritual leaders are often businessmen, and spirituality itself is a business. The Source Family has its New York theatrical premiere at the IFC Center on May 1.